Scott Morrison has never given much thought to climate change. That was obvious in 2017 when he clowned about with a lump of coal in parliament, mocking his opponents for their attitude to it. Things were very different last week when the prime minister briskly and emphatically spruiked his party’s newly-packaged climate change policy, letting it be known he now takes this subject seriously. I bet we’ve seen the last of that lump of coal. We should be pleased about this new-found enthusiasm for climate action, but I found it uncomfortable, to say the least, to sit in record-breaking autumn heat listening to the PM’s new line of argument in media interviews. Take his following responses. Let’s unpick this. First off, while Australia exploits to the hilt unreliable, unmeasurable 1997 Kyoto credits to meet future targets, New Zealand’s bipartisan climate plan rejects them. It is absurd and hypocritical to imply our plan is better because we don’t buy overseas credits. Our 1.3 per cent still puts us in the world’s top 20 emitters, where we rank second in emissions per person, behind only Saudi Arabia and nearly four times the world average. In the scheme of things, Australia is most definitely not one of the minnows. Scott Morrison’s defence of the indefensible knows no limits. As he tells it, Coalition governments have turned around a carbon abatement deficit at the end of Julia Gillard’s term of office and will beat 2020 and 2030 targets by hundreds of millions of tonnes. That claim is false. The prime minister is using a sleight-of-hand devised and refined by Tony Abbott and his environment minister, Greg Hunt, which exploits a provision of the 1997 Kyoto Protocol allowing carbon credits for reforestation and avoided land clearing. In 2014 Gillard’s carbon price scheme, which taxed measurable fossil-fuel emissions, was terminated by Abbott with the help of coal-mining MP Clive Palmer. In place of this functioning scheme, Abbott’s government set up the mistitled Emissions Reduction Fund. Ignoring fossil-fuel emissions, the ERF sought instead to put a price on “imputed” emission reductions by paying people and corporations to do things like plant trees, avoid clearing land and change farming practices. Under this regime, emissions savings – essentially just tonnages that it is agreed each project will save – are inherently unknowable, and the process opaque. Worse, we have no way of knowing whether the activities undertaken would have been done anyway, at no cost to the public purse. Morrison says that the ERF and its rebadged, refinanced successor, the Climate Solutions Fund, are turning around a mess inherited by the Coalition. But his own government’s data say the opposite: that the Coalition created the mess by abandoning a scheme that was clearly working. 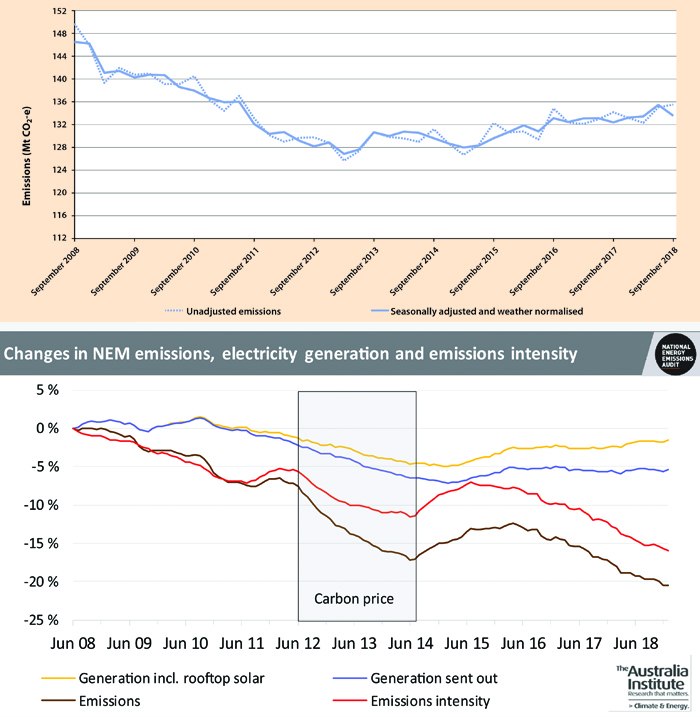 Quietly released last week, the data show that in the year to September 2018 Australian emissions continued rising as they have done ever since the end of 2014 – the year the Coalition abolished the carbon tax. Data for electricity emissions alone show an even more pronounced shift. According to emissions-tracker Ndevr Environmental, multi-year data reveal that the government is heading for failure not just on its 2020 target, but also its 2030 Paris commitment, which it is on track to exceed by well over a billion tonnes of carbon dioxide. Ignoring all this, Morrison sought to focus attention on a decline in September quarter emissions alone. Ironically this was driven by renewable power, much maligned by the government until now, which is steadily replacing a fading coal-power sector. Therein lies another fascinating twist. The Coalition and its coal-wielding leader have been proposing to finance new coal power schemes, but now the PM is shifting the government’s position. Decisions about coal’s future, he said last week, “will be made within the energy market”. That, at least, is starting to get sensible. Voters are right to be angry about the Coalition, but they should also treat Labor mitigation plans with caution. Australia must do the right thing by its people and the world and reject the downright fraud allowed by Kyoto credits. A risk-averse Opposition has yet to commit to this. Faced now with the harsh reality of man-made climate change, the least we should demand from leaders is honesty. But as this sorry saga plays out, I fear we haven’t seen the last of the lies and spin. The Hodgman government pointedly ignored climate change in the terms of reference for its solar feed-in tariff review. That counts as a failure. When a government sits down to decide how it should determine the value of household solar power to its people and their economy, it can tackle it in one of two ways. It can treat a solar installation as a home appliance, like a car, computer or space heater, evaluated for what it contributes to the state in the short-term, with a mind to fiscal prudence and the profitability of existing enterprises. Or it could take a wider and longer perspective, looking at how home solar power might help shape the radically different economy and society Australia is headed for, where physical conditions are more demanding and every individual contribution counts. Short-term solutions to immediate issues was the clear focus of the Hodgman government’s terms of reference for last year’s review of the Tasmanian solar feed-in tariff (FiT) – the amount paid to solar households for the energy they supply to the grid. Within limits of the state budget and power affordability, the review was charged with comparing Tasmania’s FiT with those of other states while examining energy cost trends, system stability and reliability of supply. 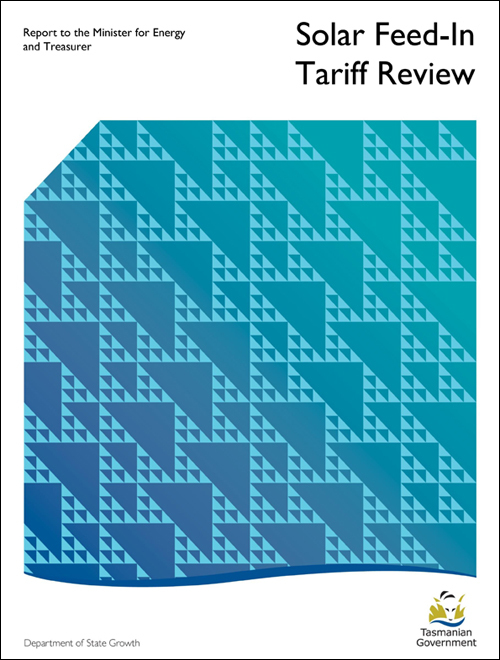 It delivered a finding that was affordable, prudent, limited – and wrong. Feed-in tariffs are for the future. Solar power is recognised as a key tool for getting citizens actively engaged in mitigating carbon emissions, without which we don’t have a hope of turning that juggernaut around. But the terms of reference made no mention of emissions or climate change. The government also asked the panel to review incentives for new installations. For the record, it settled on the current 8.5 cents a kilowatt-hour, bar a one-year grace period offering an extra 5 cents for early solar owners losing their original 28-cent deal. That doesn’t seem much of an incentive. 1st Energy, the new retailer that entered the market last week, offered an extra 5 cents for users spending over $3300 a year, but that is relatively small compensation for high power consumption. We should not discount our island’s solar capability. Danish solar yields nearly 3 per cent of the nation’s electricity; in Belgium it’s nearly 4 per cent and in Germany over 7 per cent. All these countries get a lot less sun than we do, yet our solar output is less than 1 per cent of total generation. Arguing that solar is irrelevant in a hydro state with no coal power to displace (except imported Victorian power) misses the point. Hydro needs rain but good rainfall is no certainty, so we need alternatives. Solar has the added advantage of being spread around the population at large. Tasmania’s FiT review can claim to have met expectations, but seen in this light those expectations were far below where they needed to be. The terms of reference for the panel reflect an accounting approach, not a visionary one. This has come on top of many years in which the Hodgman government has taken no decisive action to cut fossil-fuel emissions – an epic leadership failure it shares with most present and past governments in this country. Readers who have noted the government’s claim to have achieved zero net emissions in 2015 and to be tracking for 100 per cent renewable energy by 2022 must think I’m on another planet. But both those claims are dubious, to say the least. The first assumes perpetual carbon uptake by unharvested, continuously growing forests when the view of all experts – including the government’s own forest specialists – is that this is just wrong. And the claim to be a 100 per cent renewable island, like all such renewable energy claims, ignores our burning of the best part of a billion litres of fossil fuel a year to power transport and industry. Though it believes Tasmania is a global clean energy leader, the Hodgman government has done very little to make that happen. The fact is we are still far from achieving it. Governments talk about energy security and affordability, and these are important – but not half as important as cutting carbon emissions. That should be the main focus of all energy planning. We know that distributed household solar with batteries can contribute to that, both integrated into a grid using smart meters and off-grid in remote areas. We just need to know the scale necessary for this to work, and then to formulate a plan to make it happen. The FiT review found that rooftop solar was less effective in cutting electricity costs than energy efficiency, and without battery storage it could do little for network operations and energy security. But this is solar as it presently exists, not as it might become. The government wanted it that way. It restricted the terms of reference and limited the panel to public servants because it wanted to control the outcome. We shouldn’t expect much from such reviews, but in the absence of boldness and vision in the political class, where do you turn? 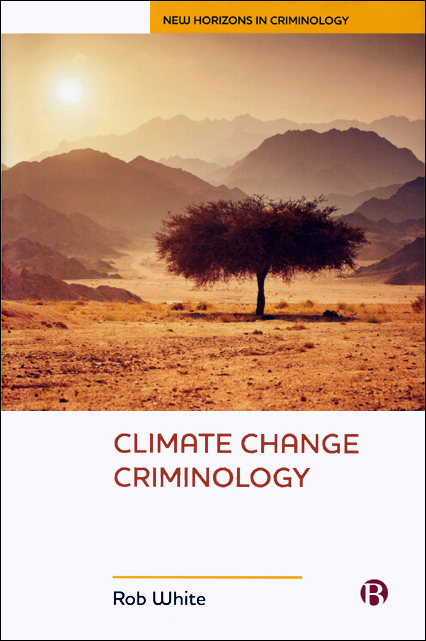 THE LAUNCH of the Rob White book, Climate Change Criminology, was postponed from last week until 21 March owing to illness. Further details at FullersBookshop.com.au. Challenges in key government seats reflect growing resentment about its neglect of climate policy. Some believe this failure should attract criminal sanction. Rob White 2018: Climate Change Criminology. Bristol University Press. There are signs that after a summer of natural disasters, in 2019 Australians will choose a federal government on the strength of its climate policies. That would make it our first climate election. Over the quarter-century since governments first pledged at the Rio Earth Summit to stop global warming, we have had nine federal elections. Not once has climate change been a key campaign topic. But you know something has changed when you hear a badly shaken Bob Katta, the Queensland MP who’s seen it all, declare he’s never seen anything like the Queensland flood disaster. He couldn’t bring himself to mention climate. He knows it’s changing, like the shocked graziers who spoke of uncharted waters, but he opts for dumb luck as the cause rather than fossil fuels. That also seems to be the position of the Morrison government. Late last year, Liberal heartland voted against the party without a climate policy and elected Kerryn Phelps as an independent MP for Wentworth on a promise to put climate back on the agenda. Now, in this election year, three senior Liberal MPs intimately associated with the party’s climate policy fiasco are facing compelling challenges for their seats – all blue-ribbon urban Liberal and all vulnerable on the issue of climate. In Victoria former environment ministers Greg Hunt and Josh Frydenberg have been challenged by MP Julia Banks and former clean energy bureaucrat Oliver Yates – both former Liberals who believe the party is in denial over climate change. The most closely watched battle will be in Warringah on Sydney’s affluent north shore, where lawyer Zali Steggall, who was once a world champion skier, takes on another athletic type. Former prime minister Tony Abbott, the arch-enemy of climate action, has held the seat for 25 years. These will be tough battles. Phelps stood in a by-election against a new Liberal candidate, but each of the new aspirants will be contesting a general election against well-entrenched incumbents with hefty majorities. But all three challengers believe the government’s climate policy failure will be their gain. The memory of this summer’s events and the nagging questions about their connection with climate change will linger into autumn. Those incumbents must be more than a little concerned. Australians are starting to understand that this is our future. They can see a time when dealing with what nature is throwing at us could conceivably overwhelm our economy, and they have come to resent the sustained neglect of climate change by government and vested corporate interests. Tusk was right. The failure of Brexit advocates to consider a foreseeable threat to peace in Ireland and numerous other bad outcomes is a sin against their people. Or in secular terms, criminal negligence. If Brexit amounts to criminal negligence, how much more so is the failure of governments and corporations to address climate change? A school of thought in universities and legal circles holds that this demands a higher level of censure than mere electoral defeat or a falling share price. There is growing support in legal circles and universities in many countries for codifying failure to take action on climate as an international crime: ecocide, or destruction of the natural environment. Climate Change Criminology, a new book by the University of Tasmania’s professor of criminology, Rob White, addresses the multiple injustices that arise when governments, along with business and other leaders, fail to deal with continuing atmospheric pollution. White, an Australian by choice having emigrated here from Canada many years ago, calls for an end to “narrow prescriptive patriotism” for the sake of the planet as a whole. Nation-based perspectives are wholly unsuited for dealing with climate change, argues White. Trying to work within national security agendas translates too easily into resource protection and defence of dirty industries. So climate change criminology must transcend national boundaries and politicians must think of their country as an integral part of the Earth system rather than just an entity in itself. Recent behaviour suggests that would not come easily to Scott Morrison. As White says, Earth has a future with or without human civilisation. If we are to be part of that future, we need politicians and other leaders to put aside nationalistic agendas and support a universal eco-justice framework. Far-fetched, maybe, but also essential. The effort needed to achieve this is on a truly epic scale, but we should not be leaving everything just to White and his colleagues. Preventing widespread destruction of Earth’s life systems is everyone’s responsibility. We should all be speaking up for eco-justice. Rob White will talk about his work at 5.30pm on Thursday in Fullers Bookshop, Hobart, where I will launch his book. All are welcome subject to prior registration.